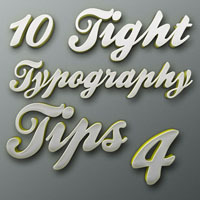 Back in April, we spent a week going over a few different little tips to keep in mind as you work on typography projects. Following these simple guidelines, you're guaranteed to put out more consistent, quality work. 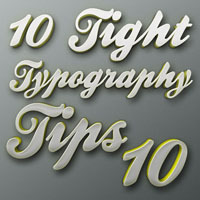 Tight Typography Tips #1 - "Background Check"
Tight Typography Tips #2 - "Size Over Scale"
Tight Typography Tips #3 - "Give Me Some Space & Stay In Line"
Tight Typography Tips #4 - "Choose Your Next Move Wisely"
Tight Typography Tips #5 - "I Like The Way You Move"
Tight Typography Tips #9 - "Breakin' Up Is Hard To Do"
Tight Typography Tips #10 - "Livin' In Style"